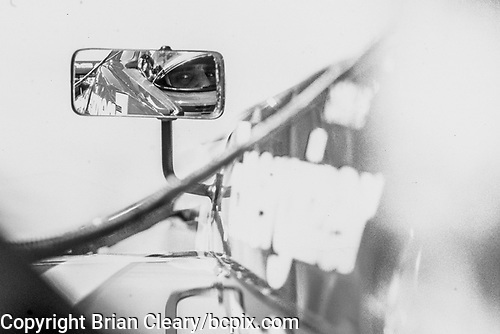 The year was 2000 and I got a call offering me a rare, at that time, opportunity to shoot the exotic open-wheel, open-cockpit Championship Auto Racing Teams (CART) indy-style cars during their annual visit to South Florida's Homestead-Miami Speedway. Given my inability then, as now, to say "no" to virtually any photo assignment, I loaded up and headed south, excited about the chance to document the racers zinging around the 1.5 mile oval at way over 200 miles an hour. Although I've often wondered and lamented the aforementioned inability to decline any photo assignment, I have to admit that that same inability has helped to make me the photographer (good or bad!) and my photographic are what we are today! Anyway, as I sit at my computer and digitize my 35mm film production from "back-in-the-day" the images remind me of a few things that stand out now and stood out then from this particular assignment. First I remember the young Colombian driver and the buzz surrounding him and everything he did in the days leading up to the event. 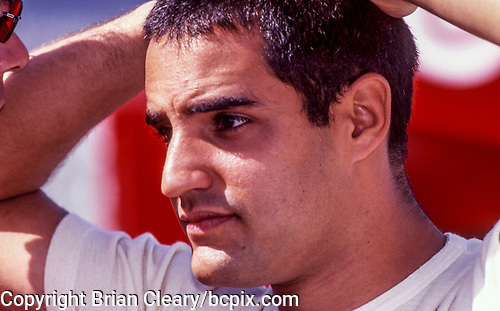 Although I did not know much about the young Juan Pablo Montoya, it was very obvious that many for the fans and drivers held him in very high esteem. The press followed him around the paddock and recorded every move he made, and the editor who I was working for made it my job to do the same. Sure enough he qualified second fastest and started on the font row and many of South Florida's Hispanic population came out in force on race day to watch him work his craft. I recall to this day the many Colombian flags flying over the front stretch grandstands and the loud roars filling the air even above the whine of the race cars as Montoya did not disappoint and charged to the front leading 21 of the race's first 23 laps. I also vividly remember how abruptly the energy drained from the arena as an electrical probable sent Montoya to the sidelines and out of the race after 23 laps. It was amazing to see so many fans stream from the grandstands and head for home once Montoya had retired rom the event. Another strong memory I have is walking the pits a day or tow before the race and noticing a couple of men standing and talking by the pit wall. I walked down to where the two men were standing a recognized Alex Zanardi who was at the time right between the Formula One and CART Indy Car portions of his illustrious career. I raised my camera and started to photograph Zanardi. Almost as an after thought I looked to see who he was talking to and immediately recognized the famous actor Sylvester Stallone! I was rewarded with a few great shots of the two men conversing. 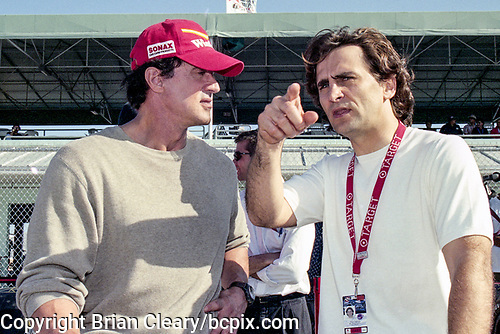 I found out later that Stallone was working on his film "Driven" which was set in the world of Indy Car racing. Finally, I was exposed to the contagious enthusiasm and positivity of the young Italian driver "Mad" Max Papis, who ended up winning the race that weekend. 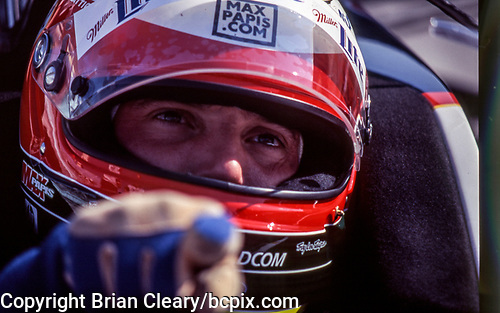 From the great race he drove, to his nearly climbing out of the car on pit road while it was still rolling after winning the race to his rating of runner-up Roberto Moreno on his shoulders in victory lane, it was obvious that "Mad Max" had what it took to be a winner on the race track and in life and that his attitude wold do nothing but elevate whatever form of motorsports he chose to participate in as his career moved forward. So, as is usually the case, a last minute photo assignment, accepted on impulse, turned out to produce memories and photographs that stick with me to this day. 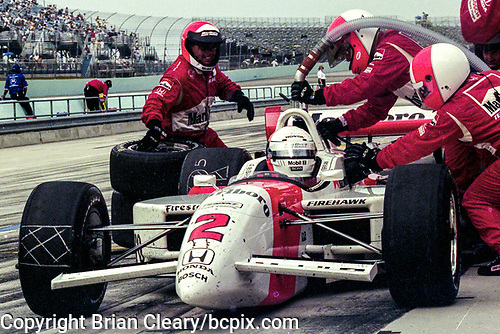 To view my entire 2000 Marlboro Grand Prix of Miami photo gallery, please click here. www.bcpix.com is the online home for the photographic archive of Florida-based photographer Brian Cleary. At this portal not only can you search and browse an ever-growing collection of photography covering more than 30 years, but many of the images are available for online purchase as editorial images, commercial images and/or personal use prints.